The New York Times has shared details behind Apple co-founder Steve Jobs’ failed attempt to set up a Macintosh manufacturing plant in Fremont, California back in the 1980s. The article, written by John Markoff, provides a look at how Jobs, fascinated by Henry Ford’s automobile assembly line process and the manufacturing abilities of companies like Sony, attempted to merge the two philosophies into a “highly automated” Macintosh factory. Apple constructed the plant in 1983. 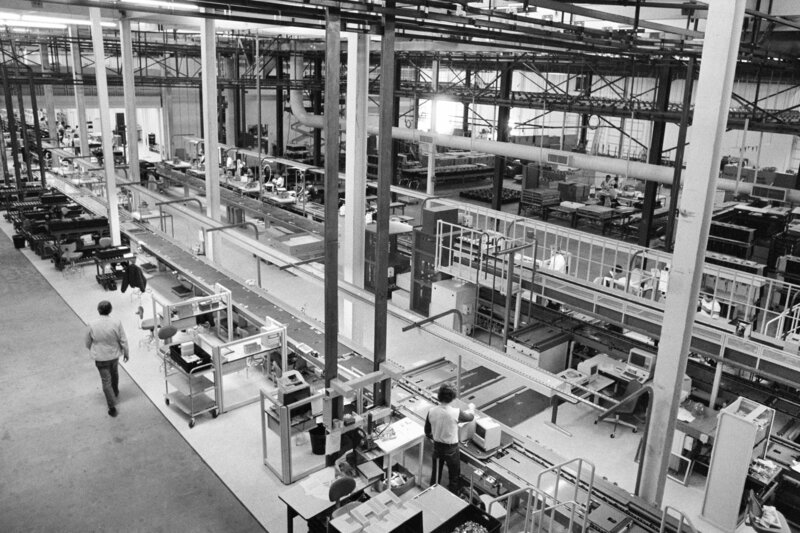 At the time, reporters were informed factory labor would account for just 2% of the cost of making a Macintosh, due to the highly-automated state -of-the-art production line. Initially, expectations for the plant were high, but all involved tasted only disappointment in the end. In 1988, when Jean-Louis Gassée took a close look at Apple’s “highly automated” Macintosh factory in Fremont, Calif., what he saw was not pretty. Mr. Gassée, a French specialist in office automation, had just been promoted to president of Apple’s product division by John Sculley, then Apple’s chief executive, and was responsible for the company’s engineering and manufacturing work. When he first started, Mr. Gassée decided to spend two days learning how the company actually built its products by working on a factory production line. Gassée’s experience on the line was humbling. “I embarrassed myself attaching a display to the computer bezel with a screwdriver,” Mr. Gassée recalled in a recent interview. At the end of his shift, Mr. Gassée grabbed a broom and swept up the parts that had fallen off the production line. “It was really shameful,” he said of the noticeably slipshod process. Apple’s attempt to build the Macintosh in the U.S. lasted all of eight years before the plant was shutdown. When Jobs made his triumphant return to Apple in 1997, he took a different approach to manufacturing Apple products. Jobs and an Apple VP named Tim Cook set up a sprawling ecosystem of foreign suppliers and assembly partners. While Apple does have a Mac Pro assembly plant in Austin, Texas, the rest of Apple’s device manufacturing takes place outside of the United States. However, Apple continues to create jobs in the U.S., as the company recently announced plans to build a new $1 billion campus in Austin, Texas. The company also plans to create thousands more jobs in a general expansion across the United States over the next three years. While the jobs being added won’t be in manufacturing, the Cupertino firm says it is on track to create 20,000 jobs in the U.S. by 2023.